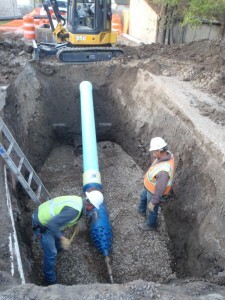 A few years ago, the city of Fort Collins, CO, decided to replace 4,000 feet of aging vitrified clay, sanitary sewer line that had caused many headaches for the municipality. The sewer line was often in need of maintenance, as the pipe had several cracks and offset joints, and its old brick manholes were deteriorating. The line was also undersized for accommodating the growing needs of the part of town it served. To make matters worse, the redevelopment of this district over the years had made maintenance access very difficult. A portion of the sewer line now had six commercial buildings and 10 mobile homes directly above it and is located within 10-feet of eight other homes. The utilities department first huddled with its design team, which included Stantec Consulting Engineers of Fort Collins, to form its plan of action. Stantec Consulting began designing a rehabilitated sewer line that would adequately convey current and future flow rates. The engineer also made attempts to find the best route for relaying the sewer to a corridor that would allow better access for city maintenance workers. The existing sewer had relatively minimum grades of .20 percent and .40 percent. With these minimal slopes and the need to extend existing sanitary sewer services and purchase a new permanent easement, the design team determined it was cost-prohibitive and not feasible to reroute the sewer line to a more accessible alignment. The new line would need to follow the old route. Through its Alternative Project Delivery Service (APDS) — a design-build-style operation that allows contractors to serve on the design team and contribute constructability knowledge — the city brought Connell Resources Inc., of Fort Collins, on as general contractor. Together, the team worked to figure out the least disruptive way to replace the failing sewer line. The majority of the 4,000 feet could be replaced through an open trench, but the 1,600-foot portion running under the business district required a trenchless method that would allow the new line to follow the same path as the existing line. The design team explored several trenchless methods, eventually narrowing its choices down to two — static pipe bursting and pipe reaming. 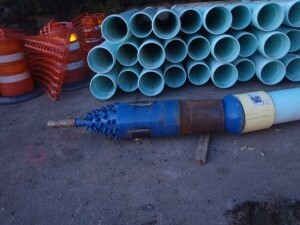 Pipe reaming was recommended by a contractor the city had previously worked with and, due to the obstacles presented by the project, it soon emerged as the frontrunner. Pipe reaming is similar to static pipe bursting in that the host pipe is split by a cutting head and its fragments removed to allow the new pipe to be pulled into the same location as its predecessor. 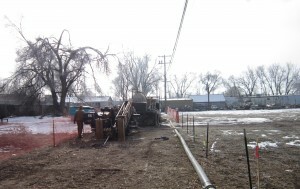 Pipe bursting disperses the host pipe fragments out into the surrounding soil. In pipe reaming applications, however, the fragments are ground more finely and mixed with bentonite drilling fluid to create a slurry which is evacuated through the manholes. The resulting pressure relief prevents any damage to nearby fragile structures or surface paving during the installation process. 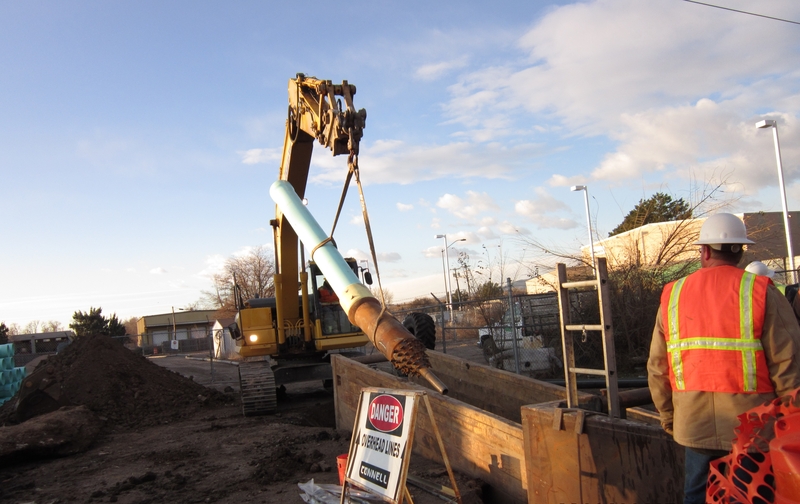 Connell Resources subcontracted the pipe reaming to Temple Construction Company LLC of Fort Collins, which licensed the InneReam pipe replacement system from Nowak Pipe Reaming Inc., for the job. The plan was to upsize the sewer line to a uniform 12-inch diameter from its initial mix of eight- and 10-inch diameter pipe to provide better sewer service to the growing neighborhood. As for pipe material, the city preferred restrained-joint PVC, as PVC is already prevalent in the Fort Collins water and sewer infrastructure. It accepted Temple Construction’s recommendation of CertaFlo Greenline, a high-strength integral-bell PVC pipe from North American Specialty Products featuring the patented Certa-Lok restrained joint system. The product is available in 10-foot lengths, as well as standard 20-foot lengths, allowing smaller and more economical construction pit sizes, and its light green color also makes it easier to see during camera inspection of sewers. Work began in August 2011. The reaming process was expertly coordinated to produce seamless pipe installations and minimize sewer service downtime for customers. The pipe reaming was broken up into sections, depending on space availability along the line. Often, an open-trench run would follow a reamed section. One small section running under a railroad crossing required a pneumatic hammer. After the businesses on the block closed for the day, Connell Resources’ crew, ranging from 15 to 18 workers, disconnected the sewer services of customers along the section to be reamed, removed the downstream and upstream manholes and set up a sewer bypass to continue service. Then, they dug 30-foot long entry and exit pits for the pipe reaming equipment so that the Temple Construction could come in early the next morning and get right to work. Throughout the project, the Connell Resources crew used a variety of excavators. John Deere 50D and 60D mini excavators were also used for dirt removal. Working with a crew of five, Temple Construction used a Vermeer 24×40 horizontal directional drill with, per InneReam specs, a 14-inch and a carbide-toothed, conical reaming head. 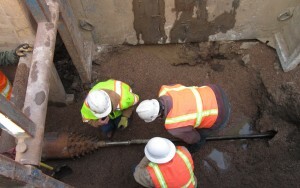 Three crewmembers worked the drill and monitored sewer line grade while two assembled pipe in the pits. Bores were made approximately five-feet below surface through clay soil with slight cobble to reach the old clay host pipe, which it ground into slurry as it moved forward. There were services every 30-feet along the line, so there were ample outlets for removing slurry with a large tractor trailer vacuum. This minimized hydraulic pressure ahead of the drill head. At the end of each ream, the crew attached the joints of 12-inch CertaFlo pipe — supplied by Ferguson Inc., in Fort Collins — onto the drill head and the pipe string was pulled into place. The crew easily assembled the pipe, adding joint after joint as the pullback process continued. The crew used 10-foot joints in the more constricted sections and 20-foot joints elsewhere. The restrained-joint PVC pipe was installed to meet a grade of .39 percent, and the reaming corrected any pre-existing grade problems. Due to excellent preparation and coordination, the pipe reamings and pullbacks went smoothly and were usually done within four hours each day. After camera inspections of the new sewer line sections were completed, Connell Resources’ crew then reconnected services and filled in excavations. All of this would be finished by the end of the work day. Together, the 1,600-feet of pipe reaming and 2,400 feet of open-trench pipe were finished in December. The project produced only minimal disruption and caused no harm to the commercial buildings or homes above it. The city has received very positive feedback from the homeowners and business owners throughout the district. As for the pipe reaming choice, Saye says it provided an excellent solution to a challenging pipe replacement, but one that could be cost-prohibitive in less-challenging projects.